Dear Friend, The Papacy is ever looking for ways to implement its ecumenical agenda. Its goal is to draw all Evangelicals into the fold of the Roman Catholic Church (RCC). Vatican Council II officially proclaimed this objective in its documents in the mid 1960’s. However, the Papacy’s problem was how to find entry points into Evangelical circles to begin implementing their new ecumenical policy. In 1967, a major event occurred among some of the Roman Catholic (RC) students of Duquesne University (Pittsburgh, Pennsylvania, USA) as they attended a retreat. That event was dubbed by some of the professors as “baptism in the Holy Spirit.” The news of such a “move of God” quickly spread to the Notre Dame University (another private RC university) in nearby Indiana. Cardinal Suenens was sent by the Papacy to estimate the rapidly growing movement. With Cardinal Suenens’ favourable report, the Papacy had a major entry point into Evangelical circles, which they exploited. This article documents the sinister power behind the Papal outreach to the Evangelicals of the modern Pentecostal movement especially among the Italian people. It also shows that what Rome means by “baptism in the Holy Spirit” is utterly different from what the Bible and Evangelical Pentecostals mean by that same term. Factual knowledge of the power behind the RC experiences shows the snare that is hidden in the RC ecumenical outreach to Evangelical Pentecostals. 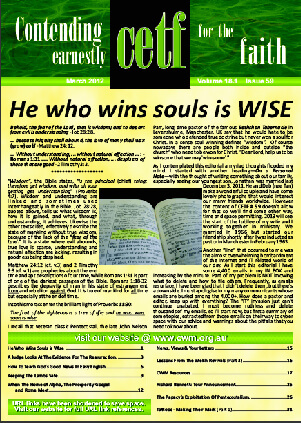 Please forward this article as widely as you can – obtainable as a PDF, html and E-Book article at www.cwm.org.au. in Los Angeles. The Pentecostal movement generated great excitement from those claiming that God was moving in the signs and wonders that were taking place at these gatherings. As news of these happenings spread, the excitement over these events increasingly drew people out of various settled denominations to join with those who desired “baptism in the Spirit” and the signs and wonders that were associated with the movement. …in the first place, towards the restoration, both in rulers and peoples, of the principles of the Christian life in civil and domestic society…and, secondly, to promote the reunion of those who have fallen away from the Catholic Church either by heresy or by schism, since it is most undoubtedly the will of Christ that all should be united in one flock under one Shepherd. We decree and command that throughout the whole [Roman] Catholic Church, this year and in every subsequent year, a Novena shall take place before Whit-Sunday (Whit Sunday is the seventh Sunday after Easter, when Christians celebrate the sending of the Holy Spirit to the first followers of Christ), in all parish churches…[to] duly pray for Our intention. Unite, then, Venerable Brethren, your prayers with Ours, and at your exhortation let all Christian peoples add their prayers also, invoking the powerful and ever-acceptable intercession of the Blessed Virgin…. 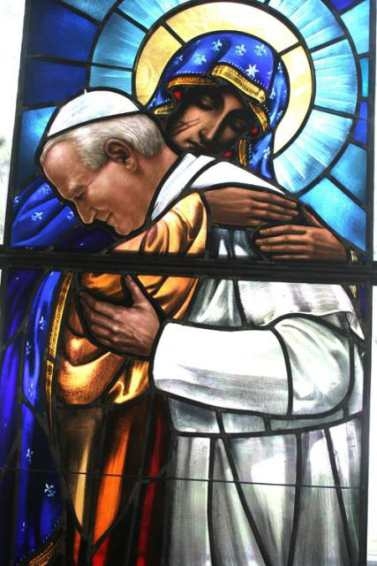 While purporting to call upon the Holy Spirit to unite all Christendom under the RCC, the Pope was in fact commanding Roman Catholics to invoke through novena rote prayers the one they call the Queen of Heaven, in order to obtain the success of his ecumenical agenda. The objective of Pope Leo XIII’s ecumenical agenda of 1897 was officially and more fully decreed in the documents of Vatican Council II in 1964. At the time, implementation of the Papacy’s agenda meant finding the necessary entry points into the Evangelical world. A major one soon presented itself. In 1967, two years after the close of Vatican Council II, an event occurred at Duquesne University in Pittsburgh, Pennsylvania (USA) initiating claims of Pentecostal happenings within the RCC. These claimed “baptisms in the Holy Spirit” at Duquesne caused a great stir in Roman Catholic circles. News of that event quickly spread to students and professors at Notre Dame University in South Bend, Indiana (USA) where similarly claimed spiritually powered events occurred in rapid succession. The Vatican then sent Cardinal Leon Suenens to the U.S. to analyze the movement. The Cardinal approved and enthusiastically advocated the U.S. Renewal Movement, as it was called. With the advent of the Catholic Renewal Movement, the Papacy found that it had been given a major entry point by which to implement its ecumenical agenda within a growing group of non-Catholics. The organization and infrastructure of these non-Catholic groups were nothing compared to that of the Papacy. Thus, it was seen by the Papacy that the Pentecostals could easily be used as a liaison to make the RCC more acceptable to Evangelicals in general. The [Roman Catholic] Church and the world need more than ever that ‘the miracle of Pentecost should continue in history’...How could this ‘spiritual renewal’ not be ‘good fortune’ for the Church and the world? I am convinced that this movement is a sign of the Spirit’s action…a very important component in the total renewal of the Church. Friday night in the chapel, our other faculty advisor held up a statue of Our Lady which depicted her with her hands lifted up in prayer…In God’s plan, it was necessary for Mary to be ‘with us’ in an explicit way as we experienced a sovereign move of the Holy Spirit that Weekend. The Fathers of the Church call Mary ‘the Spouse of the Holy Spirit.’ How can she fail to be present when the Holy Spirit is at work? ...After the meditation on Mary I experienced my first communal Penance Service, and I was quite moved… (p. 35). [Later] with expectations high, I wrote on a sheet of paper: ‘I WANT A MIRACLE!’ and tacked it up for everyone to see. I didn’t know exactly what the miracle would be; I just wanted God to act with power (p. 38). When I entered the chapel I saw a few people sitting on the floor praying…I’d always believed by the gift of faith that Jesus is really present in the Blessed Sacrament, but I had never experienced His glory before… As I knelt there before the Lord Jesus Christ in the Blessed Sacrament, for the first time in my life, I prayed what I would call ‘a prayer of unconditional surrender.’…When I prayed that prayer, I was kneeling before the altar. The next moment I found myself prostrate, flat on my face, stretched out before the tabernacle. No one had laid hands on me. I had never seen such a thing happen before. I don’t know exactly what took place…. (p. 39). Ms. Mansfield states that she “wanted to ‘proclaim His marvellous deeds,’ to give witness to the Living God.” But in fact, she did the exact opposite. While she does give an historically valuable first-hand account of the Duquesne Weekend, the book simply teaches traditional RC doctrine. For instance, it teaches that the Lord Jesus Christ is in the communion bread, which is gross idolatry. How does such idolatry align with her desire to “proclaim His marvellous deeds?” Then how could one of the professors conclude that the event regarding her prostration before the communion bread be deemed “baptism in the Holy Spirit?” What is missing in all this is “the love of the truth” and the desire for it at all costs – which in this case would mean giving up the apostate RCC with its false gospel and unbiblical doctrines. Immediately after the Weekend Fran told me she didn’t like ‘the whole operation,’ and was afraid that we were leaving the Church. Quite the contrary, I felt that I was discovering the Church in a wonderful new way. One of the first things I did after the Weekend was to take The Documents of Vatican II and look up every reference to ‘Holy Spirit,’ ‘charisms’ and ‘spiritual gifts.’ As intense as my experience of the Holy Spirit on the Weekend was, if the Church tells me this is not authentic, I would rather renounce my own experience than ever leave the Catholic Church. The most common understanding of the Baptism in the Spirit among [Roman] Catholics is that it is ‘a release’ of the graces already received in Baptism and Confirmation. Such an interpretation of the “Baptism in the Spirit” works nicely with traditional RC doctrine and has readily been accepted as such, according to Ms. Mansfield and the other Roman Catholics whose testimonies are in the book. Mary has a continuing role as Mother of all God’s children, Mother of the Church. And her spiritual motherhood is intimately linked to the work of the Holy Spirit….As we entrust ourselves to the heart of Mary, she will lead us faithfully to the heart of Jesus her Son. Jesus Himself, along with the Father and the Holy Spirit, are in essence one God, the trinity of Persons in one nature. The nature of God is totally separate from all persons and things that He has created. Thus, the teaching that the person of Mary has an intimate relationship with the Holy Spirit as His spouse is utter blasphemy. It is a sacrilegious deception of Satan. While the Scripture states, “Satan himself is transformed into an angel of light,”(2 Corinthians 11:14) it still comes as a shock to see the Prince of Darkness, the one most alien to the light, misuse Mary until he has her appearing like a goddess married to the Holy Spirit. In fact, the book manifests what Scripture calls “another spirit,” a spirit that is utterly opposed to God the Holy Spirit, who leads lost sinners to the Lord Jesus Christ; it is “another spirit” that leads souls to hell. …. be sober, be vigilant; because your adversary the devil, as a roaring lion, walks about, seeking whom he may devour - 1 Peter 5:8. Satan is the chief deceiver, and the Papacy’s ecumenical ploy to use Pentecostalism as a vehicle into the broader Evangelical camp is sinisterly evil and, yet sadly, has been highly successful. From the late 1960’s, the Catholic Charismatic Renewal was presented as a movement that from the outside looked like Evangelical Pentecostal spiritual power events. The terminology, “baptism in the Holy Spirit,” used by the RC authorities to describe these new power events in the RCC was borrowed directly from the Evangelical Pentecostals. However, the interpretation of those same events was advanced by the RCC with a very different message than that which the same terminology carried within Evangelical Pentecostal circles. The RC Pope, cardinals and bishops who before Vatican Council II arrogantly disdained Evangelicals as heretics, after the Council spoke softly concerning them. Evangelicals were no longer called “heretics” but rather “separated brethren.” Further, after Vatican Council II, Roman Catholics were allowed to go to Evangelical Bible studies, churches, and other events. Most of these people had no understanding other than what the RCC had taught them. Consequently, many RCs, suffering under dead religious rituals, were excited to take part in a movement that seemed to be from God through the gatherings held outside RC authorized places. and also with accepting Roman Catholics who were believed to be “filled with the Spirit.” The movement had great influence through The Positive Confession teachings propagated by Kenneth Hagin, Kenneth Copeland, Charles Capps, and others. More Charismatics surfaced in the 1980s and 1990s. Indeed, outside the RCC the Latter Rain movement saw itself as a returning to the “full gospel” of the early days of the Christian church. However, what was being taught was the falsehood that a person could virtually become God (directly experience God). Scripture states, “for there is one God and one Mediator between God and men, the man Christ Jesus.” This means that there is no person who can emulate God (can directly experience God). Nevertheless, pious experiences that looked and felt so mysteriously spiritual were like a net cast over the unwary and the unbiblical. In this scenario of feelings, the Papal ecumenical overture was quite successful with some Word of Faith leaders, among whom were Paul Crouch, David Mainse, John Arnott, C. Peter Wagner, Kenneth Hagin, Kenneth Copeland, and Benny Hinn. The director of the Swedish Pentecostal Churches was one of the selected to shake hands with the Pope during a Pentecostal delegation study tour to Rome and the Vatican together with a delegation from the Catholic Church in Sweden. The visit was part of the dialogue between the two churches which started in 2003. During the audience, which gathered up to 50,000 persons, the Pope talked about prayer and delivered a special salutation to Sweden, a gesture which gives expression to the interest in the ecumenical process in Sweden by the highest leader of the Catholic Church. Pope Honours Fr. Michael Manning of The Word in the World on TBN and Celebrate Easter with TBN’s Premiere of Mel Gibson’s The Passion of the Christ. Traditionally, the message of the Gospel in Latin America has appealed to the working class. But changes have begun to take place, and many middle and upper-class people are now opening their hearts to Jesus Christ. Some of this is happening through the Catholic charismatic movement. Wagner does not differentiate between the false gospel of RC Charismatic movement and the true biblical Gospel. My upbringing, of course, was Catholic in that I attended the Catholic school in Jaffa, Israel. And so my mentality basically is a Catholic mentality. When I was born again, I was Catholic in my ways. I was very Catholic in my ideas, in my behaviour. It was August 1970 when God’s grace truly touched me. 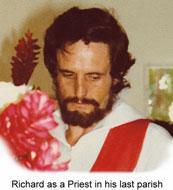 I began working in the charismatic movement, which was a fresh movement in the Catholic Church. While there were all kinds of decrees and dogmas coming out of Rome, the movement at the beginning tried to have just one manual, the Bible…We were stressing praise and worshiping and glorifying God. The Church does not derive her certainty about all revealed truths from the Holy Scriptures alone. Both Scripture and Tradition must be accepted and honoured with equal sentiments of devotion and reverence. Sacred Tradition and Sacred Scripture then are bound closely together and communicate one with the other. Thus, while some RC Charismatics had a correct biblical position in the opening years, most did not. The Papacy vigorously upheld its traditions, and those of us who were priests and leaders within the Renewal were told to remain faithful to the Church and to avoid exposure to non-Catholic teachers and evangelists. Nonetheless, some of us who were ardent RC Charismatics discovered that the teachings of the RCC were unbiblical when we had the opportunity to hear the teachings of Evangelical Pentecostals. While we realized that there were some difficulties in doctrine within Pentecostalism, by the Lord’s truth and grace, each of us came to biblical faith; and while several of us have gone to be with the Lord, most of us are alive today rejoicing in our salvation. September 14th is a milestone for the life of the Catholic Charismatic Renewal [CCR] in the world. Eighteen years ago the Pontifical Council for the Laity of the Holy See enacted the recognition of the International Catholic Charismatic Renewal Service (ICCRS) as an entity for the promotion of CCR. While the Institute is supposed to be a liaison between Charismatic affairs and the Vatican, in fact it is but one more level of dictatorial Papal authority. It is mostly a disenfranchised movement not having any meaningful influence in the Catholic Church’s hierarchical system. Consequently, some Catholic Charismatics are beginning to wake up. For by grace are ye saved through faith; and that not of yourselves: it is the gift of God: Not of works, lest any man should boast - Ephesians 2:8-9. Therefore, the Catholic Charismatic or otherwise, must recognize that the Papacy’s sacramental system is “another gospel,” which is no gospel at all. Rather, a person must have personal faith on the Lord Jesus Christ. This faith is given to him by God’s grace alone. Thus, while the Papacy has attempted to exploit Pentecostalism, it has in many cases backfired. Quite a few Roman Catholics, who have awakened to some things biblical and met genuine Christians, have prayed and sought the Lord and have come to Him—by grace and through faith alone. We are all, as human beings, initially cut off from God and are spiritually dead, as a condemned malefactor is said to be a dead man. Water cannot flow uphill, nor can the natural man act contrary to his corrupt nature. What then can you do, just how can you be made right with God? ….the hour is coming, and now is, when the dead shall hear the voice of the Son of God: and they that hear shall live.